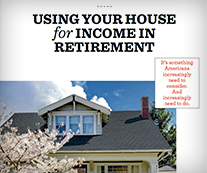 Using Your House reviews the two most common ways to use your house to boost your income in retirement – downsizing and a reverse mortgage – with clear examples, a discussion of the pros and cons of each approach, and links to tools on the web where you can get estimates of what downsizing or a reverse mortgage can do for you. Using Your House for Income in Retirement is available for $2.75 each (1-99 copies) or $2.50 each (100 or more copies), plus shipping. To place an order, click here. © 2014, by Trustees of Boston College, Center for Retirement Research. All rights reserved.